Rally driver Kev Monaghan suffered mixed fortunes on the Tour of Epynt rally last weekend when he was forced to retire his Vauxhall Corsa on the final stage after showing good pace all day. The rally was the opening round of the 2012 MSA Asphalt Rally Championship and Monaghan and co-driver Chris Purvis were hoping to kick off the season with a good haul of points. 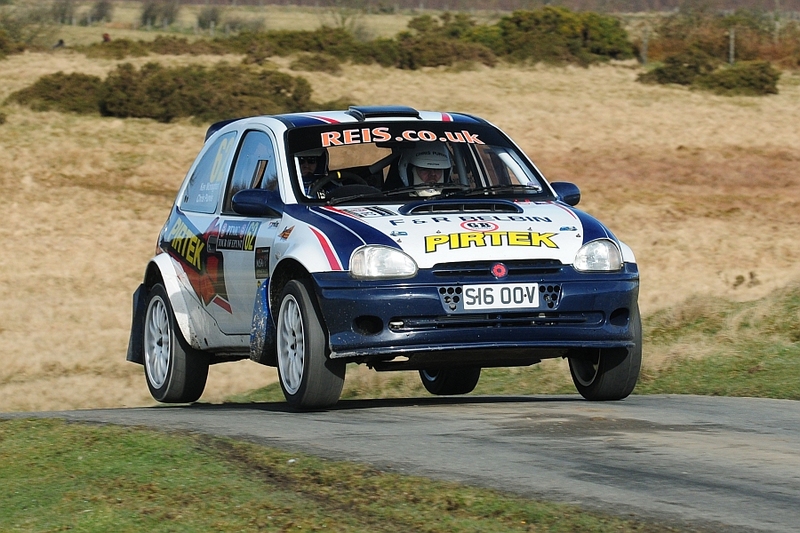 They made a steady start in their Pirtek-backed Corsa Kit Car, lying fourth in class after the opening pair of stages as Monaghan got used to the new paddle-shift gearbox which had been fitted over the winter. Stages three and four were a repeat of one and two and Monaghan increased the pace to move up to third in class after a troublefree run across the notoriously tricky tarmac of the Epynt military ranges. "We took it easy on the first two stages as it was the first time I have used the paddle-shift gearbox in competition," said Monaghan. "The second loop of stages was quicker for us and third was a decent position to be in at the mid-way point." The second half of the event consisted of three long stages, all of which included some of the high-speed jumps which have caught out many rally crews over the years. Monaghan maintained his third in class after stage five and decided to push hard in stage six. Part way through the stage the Corsa spun and hit a rock but the crew were able to continue with a few seconds of time lost. Back in the service area after stage six the car was checked over and it was found that one of the wheel nuts had snapped off. With no time left to replace it Monaghan decided to head out to the final stage with three nuts holding the wheel onto the car. Despite driving cautiously the remaining nuts sheared approaching a corner in the stage and Monaghan was unable to continue. "We thought we would be able to get through the last stage and pick up some points even though we would have to take it very easy. Sadly it wasn’t to be as the wheel parted company with the car part way through the stage forcing us into retirement. Fortunately there was very little other damage to the car so it will soon be fixed and ready for the next event." "Thanks to F & R Belbin Engineering and GB Lubricants for their support and also Darren and Sue Underwood for their hospitality. It’s a shame we didn’t get a finish but I’m pleased that I have built up more experience of Epynt and showed that we are on the pace again this year." Monaghan’s championship campaign will continue in May when he competes on the Isle of Man for the first time in the Manx National rally.